This is the 4 inch head Pot Still with the 50 Gallon Boiler. This set up for your distillery comes Electric. With REMOVEABLE conical lids. The option for heat is 2 times 5500 watts, if you need any more let me know. This can also be used for propane burner, and the elements are replaceable or can be covered with caps, add on drop down menu. All copper and All Food Grade SS. This comes with cleanout spigot 1 1/2 inch, 4 inch ferrule on top, thermometer, drain, temperature gauge and that is removable, too. This comes with glass (polycarbonate) window. This still is perfect for Whiskeys Rum Brandy Tequilas. It is a great Stripping Still, it can strip up to 14 plus gallons an hour. 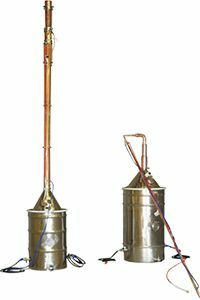 SHIPPING TO BE CALCULATED LATER- but freight for the boiler is around 300-350$ and the 4 inch Pot Still tower is usually around $150 for the furthest away in USA. Please note this. You can pay up front this average, call us. This was custom job for distillery for aBrandy Still.